Churches are as old as Christianity itself - about 2000 years. Ever since the Middle Ages they have been regarded as magnificent buildings and at the same time, as symbols for encounters with God and a feeling of security. In the modern religious buildings of the past two decades, the traditional Christian symbolism and an innovative language of shape have merged to form new connections. Because of this freedom of design, designing a church is still a dream for many architects. In this article you will discover three dreams which have come true. Churches in Germany were only constructed in historical styles, such as the Romanesque and the Gothic style up until World War I. Afterwards, the new architectural styles which were developed until the 1950s were characterized by freedom and a new beginning. The architects, Le Corbusier and Don Bosco, served as role models. 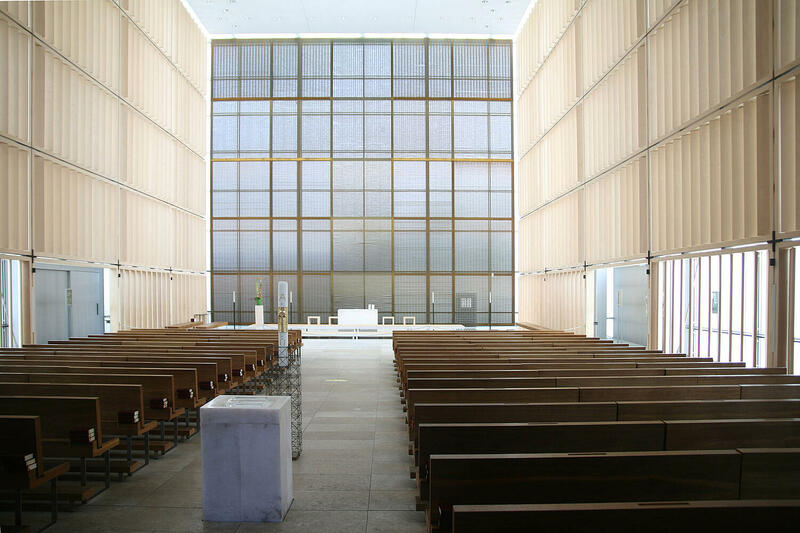 Their religious architecture shows an expressive design language which, for example, is clearly illustrated in the pilgrimage church of Notre-Dame-du-Haut in Ronchamp, France. In addition, it was intended that everyone gather around the altar and the opposition between priest and congregation was eliminated. Architecturally, this was reflected, for example, in the arrangement of the altar in the middle of the church space, surrounded by pews. Modern church buildings are also a mirror of their time. Century-old traditions play an equally important part, as do innovation and sustainability. The opulent facilities in churches from earlier eras has given way to a new minimalism: instead of sensory overload there is a reduction in what is essential. This creates space for the transcendent experience: the encounter with God. Art - formerly present as paintings, sculptures and frescoes - shows itself in modern churches through a plain and different form. 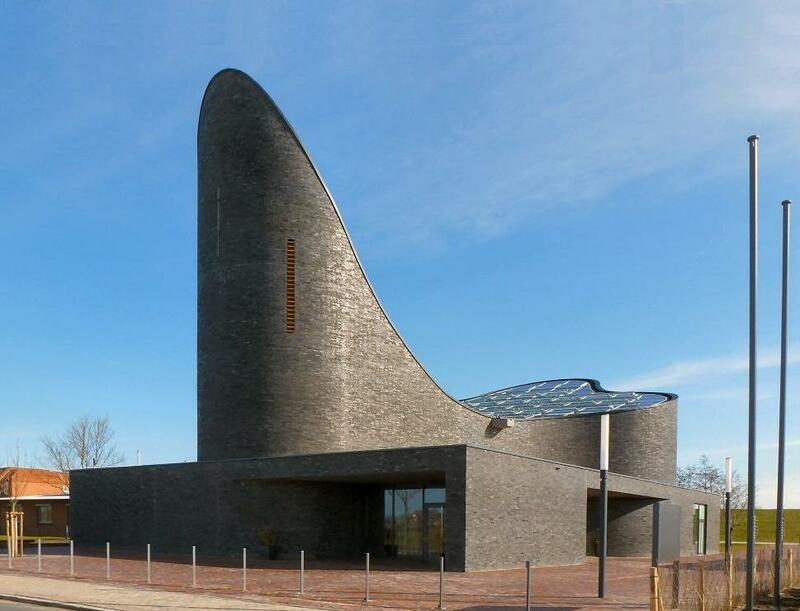 The St. Mary's Church on the North Sea coast in Schilig demonstrates a clear, modern design language: Its curved glass roof construction is reminiscent of dunes and waves. Shell limestone and sandy-colored natural stone were used in the interior as construction materials - elements of the sea. For this reason, the building is also nicknamed the "church by the sea". Königs Architekten of Cologne were in charge of the construction of this modern church. They managed to bridge the gap between the traditional symbolism of a house of God and the demands of modern religious architecture. The floorplan of "God’s halfpipe" is wholly traditional. In addition, three bells and the stained glass windows originate from the previous church. New, on the other hand, is the unique, illuminated ceiling construction: Special bands below the roof beams transmit the incidental light in a wave form onto the interior walls. 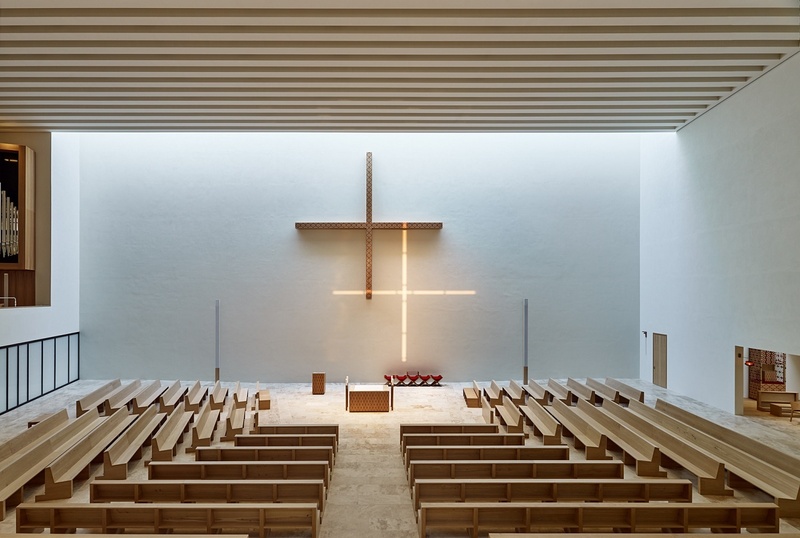 For the Catholic provost church of St. Trinitatis in Leipzig, the architects Schulz and Schulz concentrated on regional, traditional building materials. Rochlitz porphyry adorns the straight facade of the modern church building. In addition, the design is reminiscent of the inner courtyard of the Leipzig arcades. The 50-meter-high bell tower forms the gateway to the Leipzig city center along with the tower of the new town hall which is in close proximity. The church is also impressive in terms of sustainability: PV systems and geothermal energy ensure that there is sufficient energy. The interior is simply designed. Only a large wooden cross on the wall directs the viewer's eyes in the direction of the altar. Art and building form one unit in this house of God: This is reflected in the stained glass windows, the organ and the liturgical furnishings such as the confessionals or the stoup. 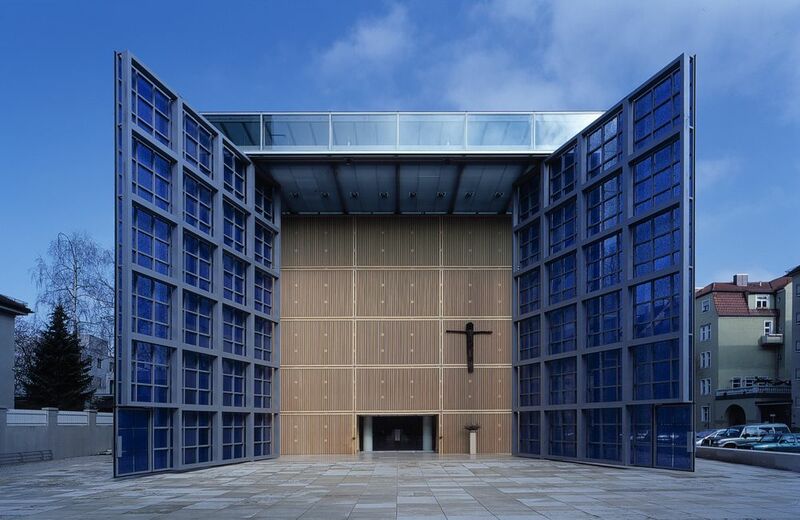 The Sacred Heart of Jesus church in Munich was designed by the architects Allmann Sattler Wappner and was completed in 2000. It appears as a simple glass box with wooden boarding. The double shell construction consists of an interior and outer skin. This not only saves energy but also creates an ideal climate. The cubic, maple wood shape stands for a feeling of security - a key element in the religious architecture. The simple design of the interior leaves room for transcendent experiences. A modern element in this holy building is not only the shape but also the technology: The front can be opened as a huge two-winged door and shows the church to be a place of welcome. At night, the building lights up like a crystal thanks to its impressive lighting technology. These three examples show how the traditional symbolism of church buildings can be harmonized with the demands of modern times. A reduced construction style, a clear design language and sustainable energy concepts create ornate meeting places with a feeling of complete security. Historic church buildings, on the other hand, sometimes are given a new form of use. Learn more in our article about what possibilities are already available for "new life in old buildings".